After the action-packed debut that introduced us to the world of 'Romulus' by Bryan Hill and Nelson Blake II, the second issue slows it down a bit and we get more familiar with Ashlar and Nicholas. It's hard to come out of the gate with a balls-out cinematic adventure like 'Romulus'#1 and sustain it in proceeding chapters. Luckily, Hill doesn't try for the most part and instead builds these characters we just met. Ashlar's crusade against the Romulus who are out to kill five billion people continues but Nicholas doesn't seem rattled by this fact at all. In fact, Nicholas wants to help because there's noting his well-inflated ego and high intelligence can't accomplish. Ashlar, unimpressed has more problems to deal with. A number of new characters are introduced. A psychic pop star, a devout Romulus advocate, and a deadly new foe emerges. They all add to the Romulus mythos in different ways. Ashlar, as hellbent as she is to get her revenge, doesn't have all the answers so Sozo, the pop star, helps add some perspective and scope at what she's up against. Ashlar resists the assistance but soon realizes a little help might not be a bad idea. Achilles' fierce intro returns the books to action near the end of the issue. He's another Romulus assassin and like all of Nelson Blake's art so far, this is another fresh and distinctive design that energizes the issue. A lot of these type of stories tend to lean darker in tone and appearance but Blake isn't afraid to live in the light, echewing shadows and noir effects with simple straightforward out-in-the-daylight action. It's a refreshing clean look that portend anything can happen at any time. Hill is building this new world and fleshing out the characters more in issue two. He aptly balances the exposition with exciting action sequences beautifully choreographed with Blake's artitistic touch. 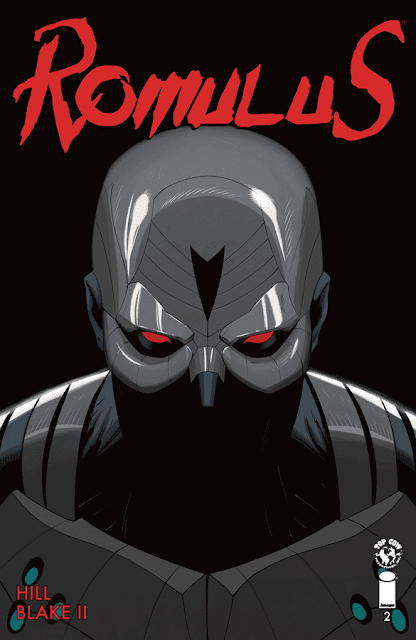 If the first issue of 'Romulus' didn't grab you then the follow-up should. Things are about to get cooking in this intriguing new series.